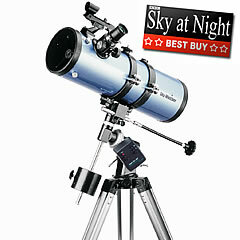 The Sky-Watcher Skyhawk-114 is a good quality Newtonian Reflector Telescope, very affordable, 114mm primary mirror, with x40, x80, x100, x200 optical viewing eyepieces supplied. It is supplied with an aluminium tripod with accessory tray, and offers good performance for a low price, and is a popular telescope under the £100 price point. The Sky-Watcher SKYHAWK models feature shorter, more compact telescope tube lengths resulting in lighter-weight telescopes of excellent convenience and portability. They are a particularly good choice of instrument for keen beginners to astronomy, wanting larger aperture and increased performance at a relatively low cost. The Skyhawk-1145PM model with its uperb Parabolic Primary Mirror & R.A. Motor Drive, for Automatic Tracking purposes, represents an outstanding, high quality package for the more Serious Novice Astronomer. Tube material : Aluminium.